Publisher: Pacifica Pub Inc, Santa Monica, California, U.S.A. THE DEN OF THE ASSASSIN takes audiences on a thrilling global geopolitical journey that begins in New York City's Wall Street, but soon darts into the hidden and unseen worlds that exists within nations that have different agendas than the United States, including but not limited to China, Russia, North Korea, and Iran. And it is here, in these hidden worlds that unique agendas that stand against America and the West's idea of liberty and freedom are carefully hatched and cultivated. Most concerningly, as each nation has become more reliant on one another in our global society, a new level of extraordinary vulnerability to our national security has been created, one perhaps we may not be prepared for. 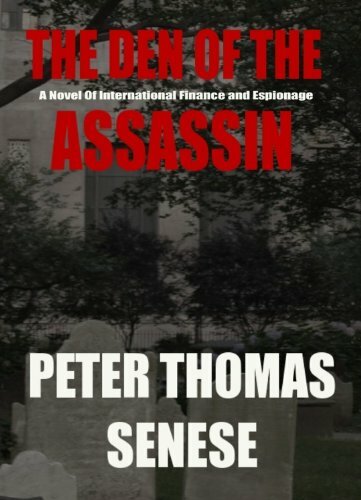 In THE DEN OF THE ASSASIN, I believe readers will find the uniquely accurate information on this subject that is carefully weaved through a intricate, entertaining storyline to be quite fascinating.<br /><br />THE DEN OF THE ASSASSIN opens in New York City, where an unassuming investment banker, Tyler Boxter, is preoccupied with his all-consuming career on Wall Street that acts as a personal shield against the trappings of life that hide guilt and pain and memories he doesn't want. In the midst of the biggest deal of his successful career, and unknown to Boxter, he is about to play a sophisticated but explosive game against a madman who is more savage and merciless than the winds of an atomic holocaust.&nbsp;<br /><br />Once a mysterious theft leads Boxter from the sanctity of his Wall Street office and thrusts him into the dark world of international terrorism -- where zealot religious leaders stir and awaken hateful minds in the brutal desserts in the capitol of the Middle East's ancient, once-mighty empire, where dark, sunken eyes eager to return to world-glory look into the abyss of Siberia's desolate terrains, where prisoners -citizens- who live on a remote peninsula in Asia would rather submit to isolationist cleansing than feel the wrath of a deceitful troll intent on destroying the ideals of the West - and where a city of scientiests continue their unseen diabolical activity deep in the earth and protected by the menacing walls that surround the Forbidden City - knowing that what they have embarked upon is the West's greatest nighmare.